I’ve previously exalted The American Grilled Cheese Kitchen for serving up perfect house made gluten free bread, but somehow until this morning it hadn’t dawned on me: the place serves breakfast sandwiches. If you’re gluten free, you know how hard it is to get your hands on anything other then eggs, yogurt, or fruit when getting breakfast on the go. Sometimes being deprived from bread in the morning can mean starvation by 11am. If you’re in the neighborhood, do everything in your power to stop at The American Grilled Cheese Kitchen for a perfectly crafted gluten free egg and cheese sandwich. 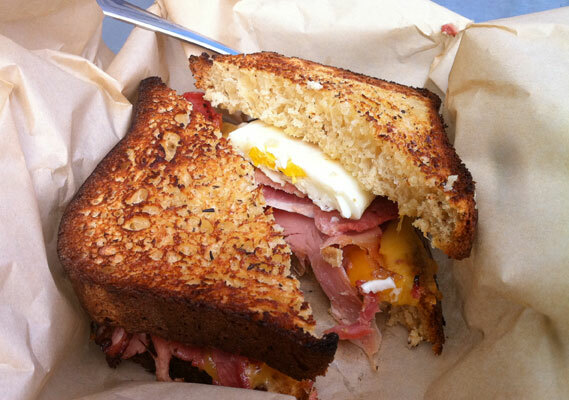 Pictured above: “Breakfast Piglet” sharp cheddar, artisan cured ham, egg, and rosemary butter on gluten free bread.